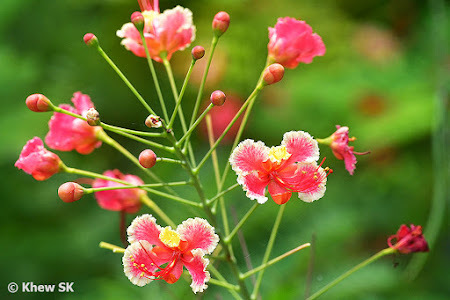 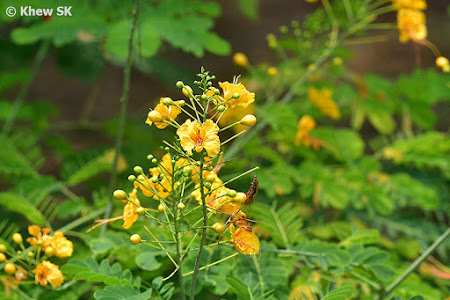 In the 16th article in the series on our local butterflies' favourite nectaring plants, we feature an evergreen bush with attractively colourful flowers, the Peacock Flower (Caesalpinia pulcherrima). The Peacock Flower is often used in urban landscaping in Singapore and is a favourite amongst landscape architects looking to add colour to their palette of greenery and lush plants. 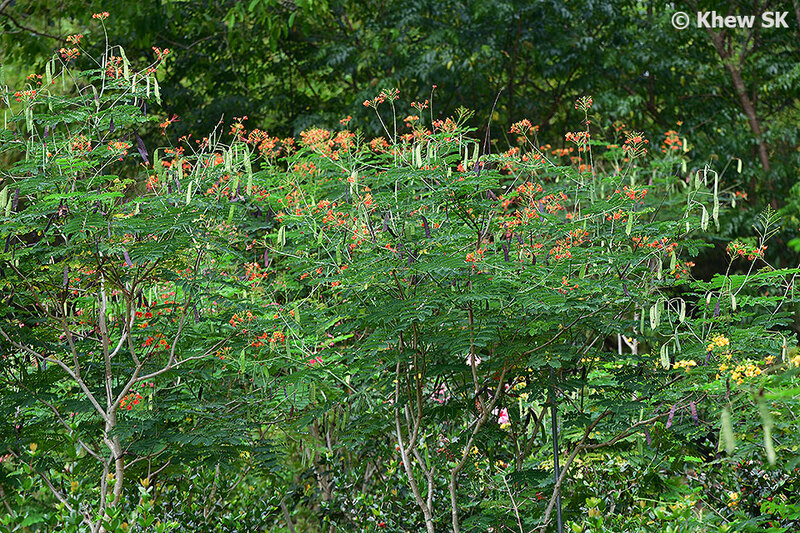 It is also regularly cultivated in public parks and gardens. 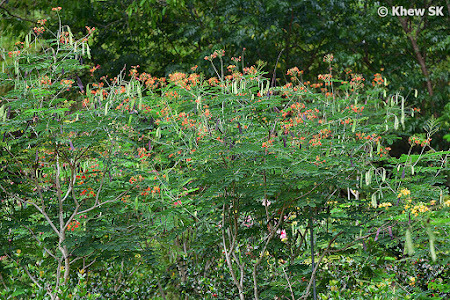 The Peacock Flower grows upright, attaining a height of 3-6 metres tall and a spread of 2-4 metres wide. The attractive shrub flowers throughout the year and usually does best in open areas in full sunshine. 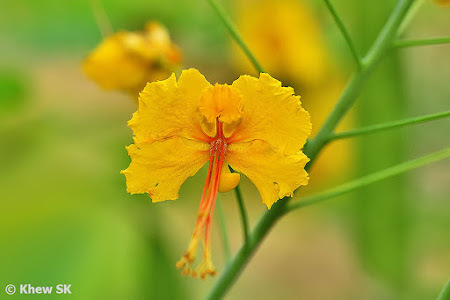 The orange-yellow flowers are pretty and uniquely shaped, with the stamens projecting well beyond the petals. Although it is an exotic, it does not occur naturally and where it grows, it has been cultivated. The genus name of this plant is in honour of the Italian physician, philosopher and botanist, Andrea Caesalpino. 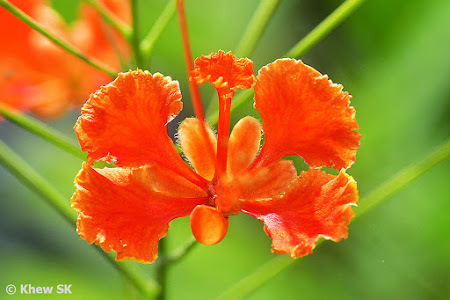 His most important publication, De plantis libri XVI (1583) is considered the first textbook of botany. 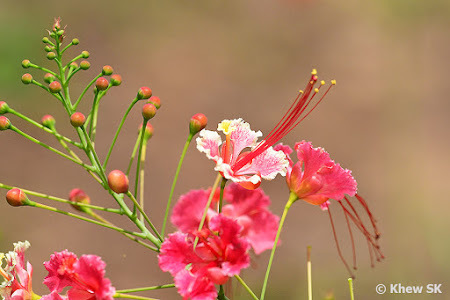 He was the director of the Botanical Gardens at the University of Pisa. 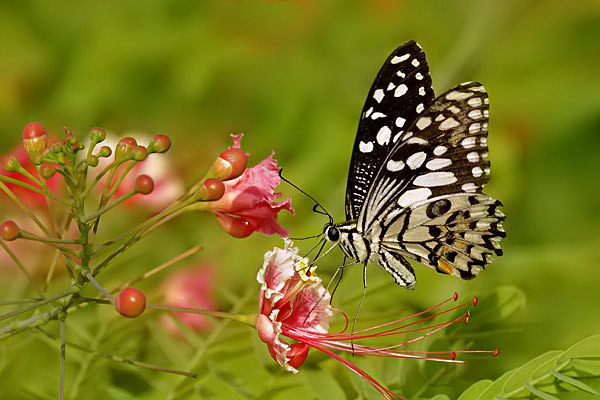 From 1592 he served as physician to Pope Clement VIII and taught at Sapienza University in Rome. 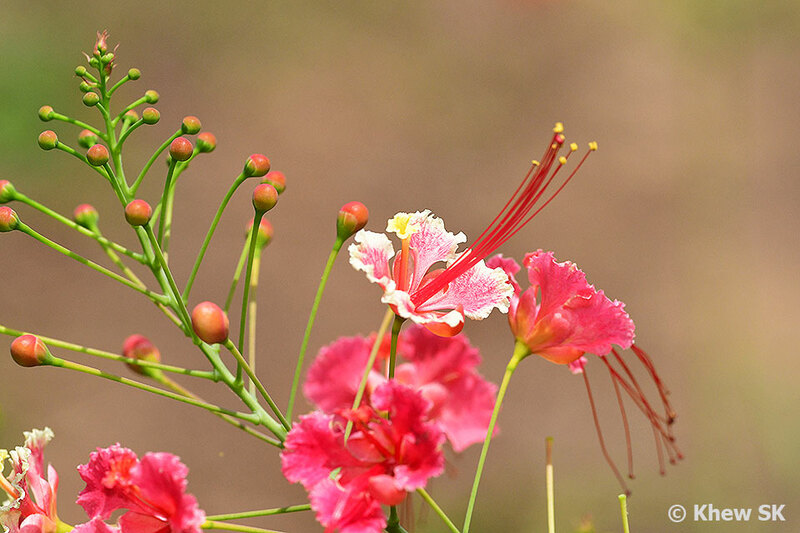 The Latin species name pulcherrima means 'most beautiful', referring to the flowers. 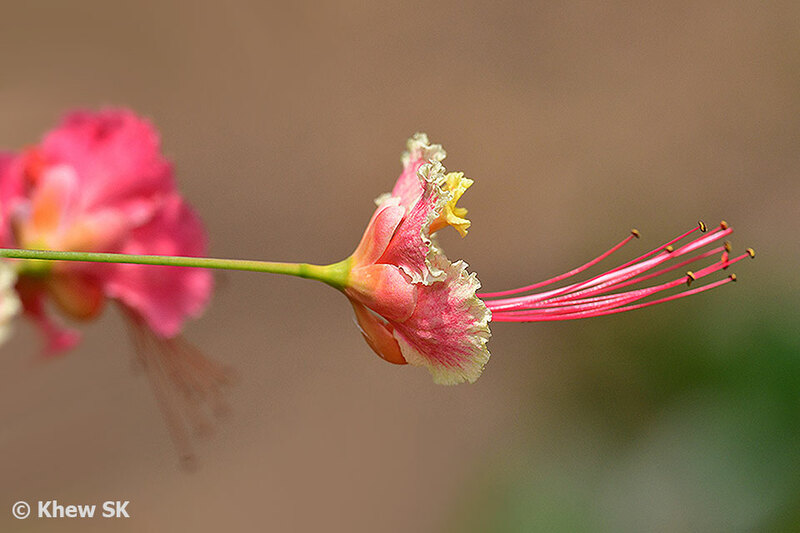 The Peacock Flower is considered an exotic in Singapore. 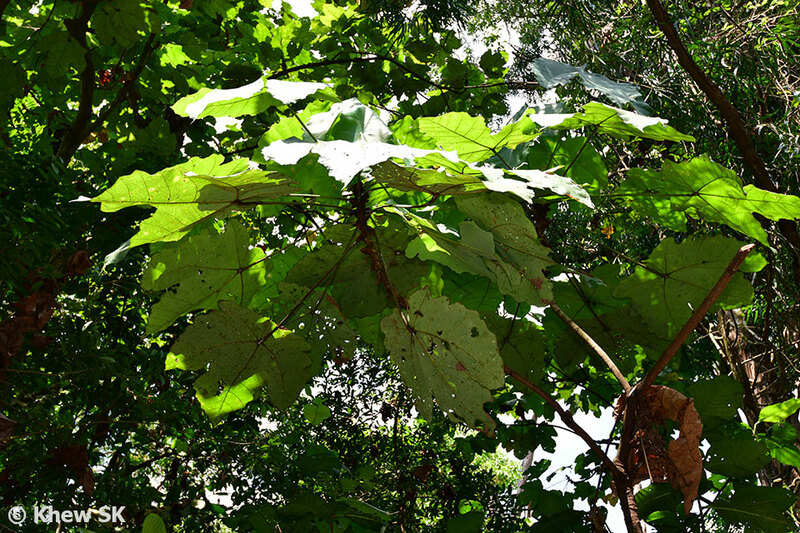 Its region of origin is the tropical Americas and was probably introduced to Singapore as a landscaping plant. 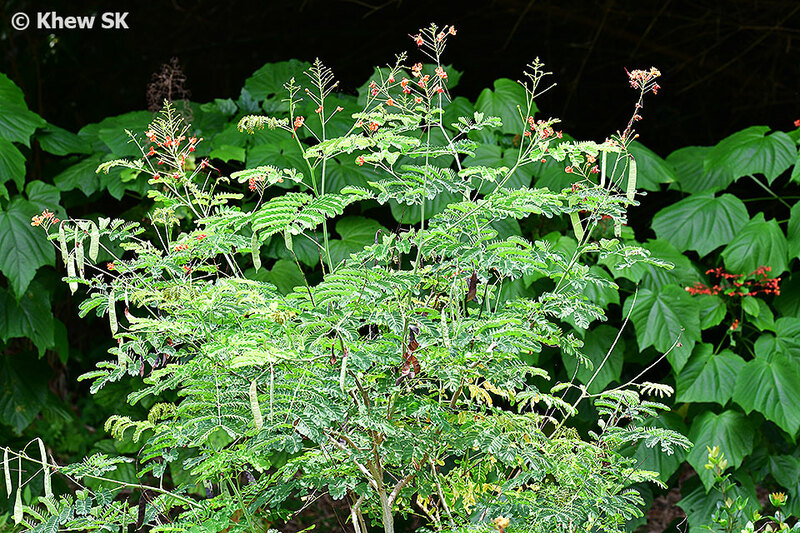 Its use is limited to parks and gardens, usually cultivated an accent plant or as a boundary hedge. 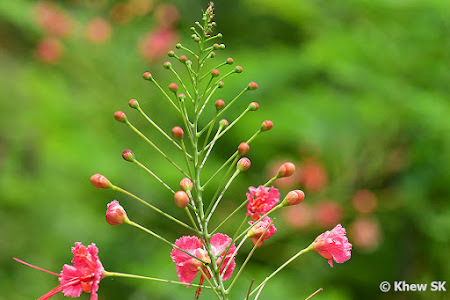 The brittle branches and sometimes thorny stems are considered negative attributes of cultivating the plant in urban gardens, and placing the plant adjacent to human traffic should be avoided. 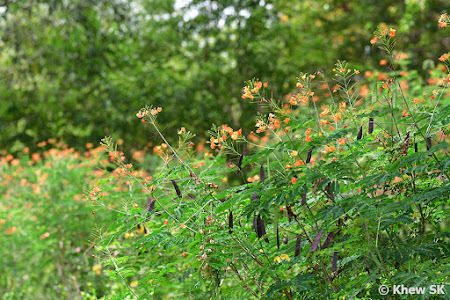 The Peacock Flower is a sprawling evergreen perennial shrub (or a small tree) reaching a maximum height of 6 metres, if left unpruned. 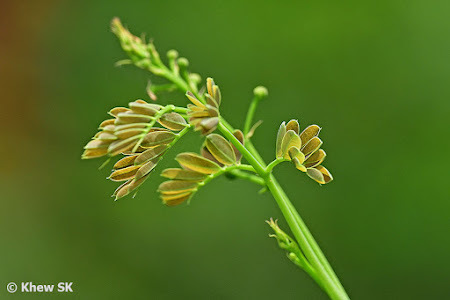 Its deep green foliage is bi-pinnate, typical of Fabacea (Leguminosae) species. The leaves are fernlike and twice compound, with many small, oval leaflets. The flowers are borne on terminal clusters of about 20-30cm tall. 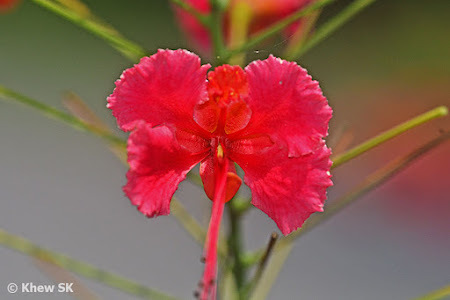 Each flower is bowl shaped, 2-3" across, with five crinkled, unequal red and orange petals, and ten prominent bright red stamens that extend way beyond the corolla. There is one modified petal which is smaller than the other 4 petals. 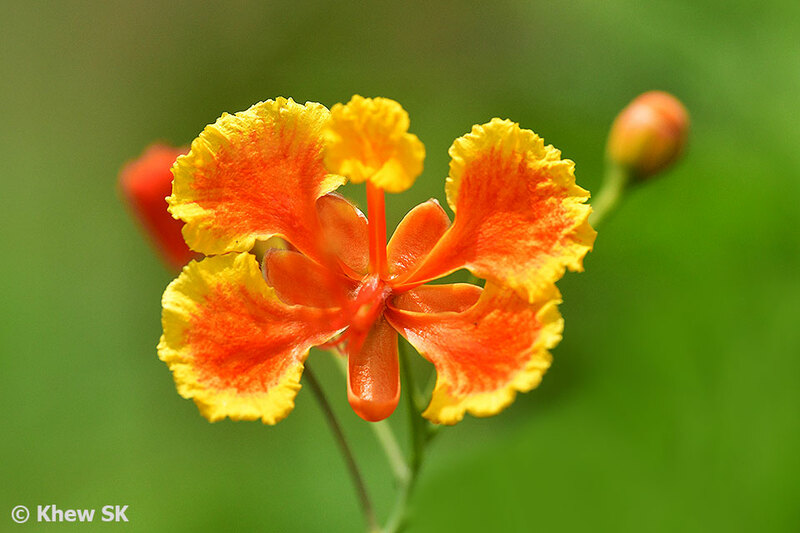 The typical orange-yellow flower hybrid is the most common one cultivated in parks and gardens. 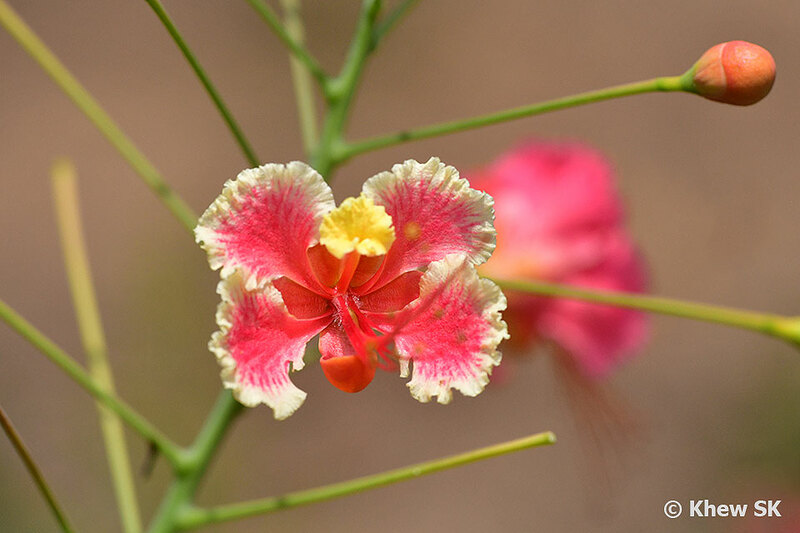 However, there are other hybrids which feature all-yellow, pink-white and all-red flowers. 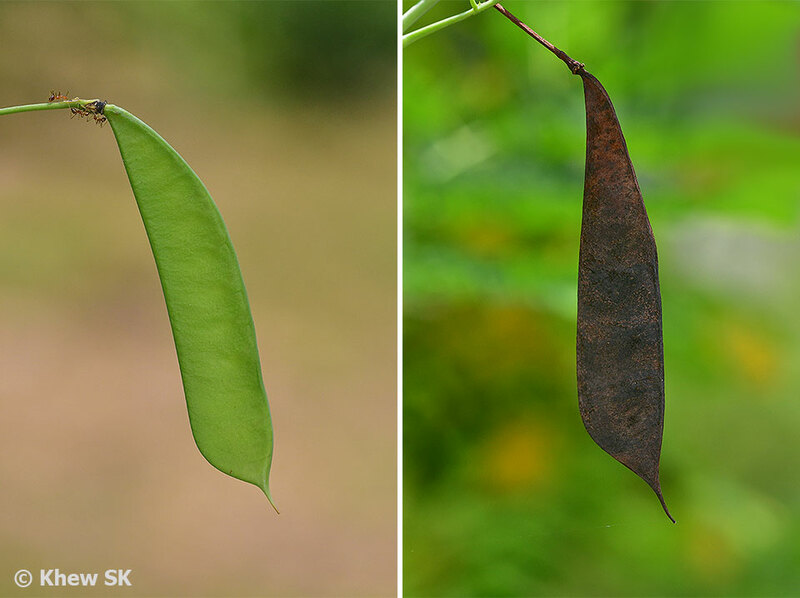 The fruits are oblong, with thin flat pods of up to 10 cm long and look like Snow Peas. 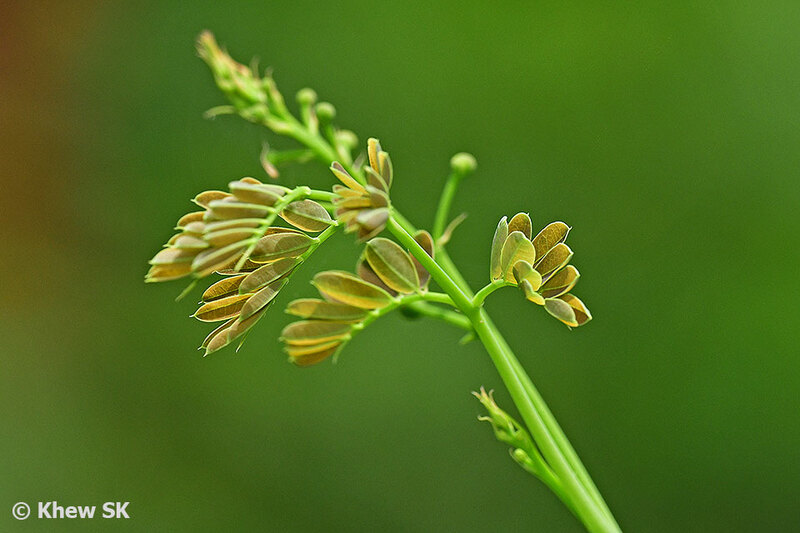 The pods are light green when immature, turning to a dark brown when ripened. Each pod contains 8-10 flattened dark brown to black seeds which are ejected as the pod splits open at maturity. The Peacock Flower is only moderately attractive to butterflies, particularly the larger species. 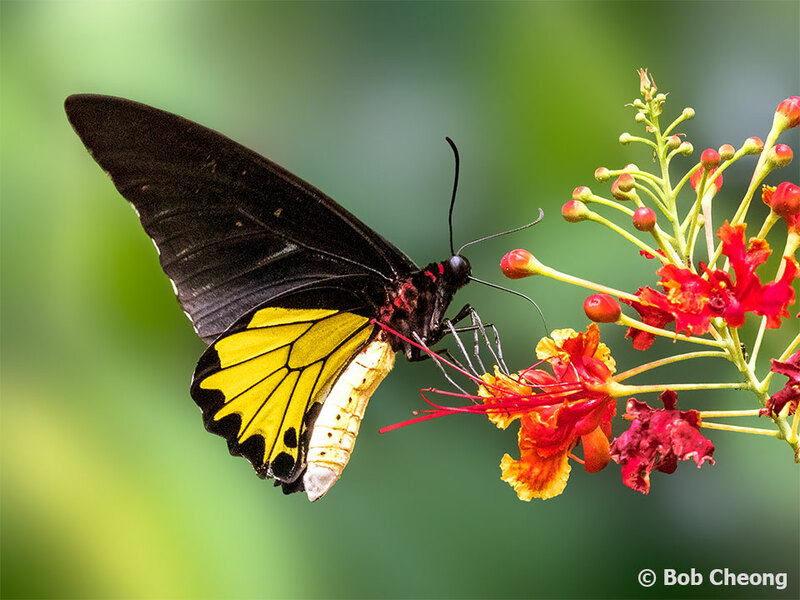 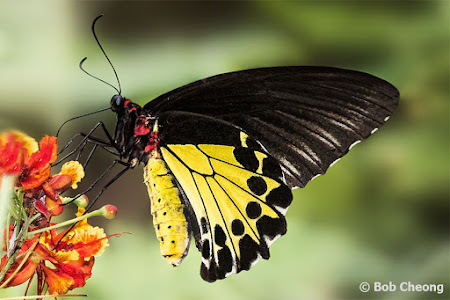 This may be because of the shape and design of the flower, which require longer proboscis of the larger butterflies to reach into the flower for nectar. 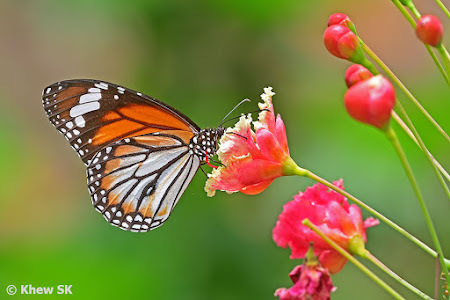 In the field, there are occasions when no butterflies visit the flowers at all, especially when there are other preferred nectaring plants in the vicinity. 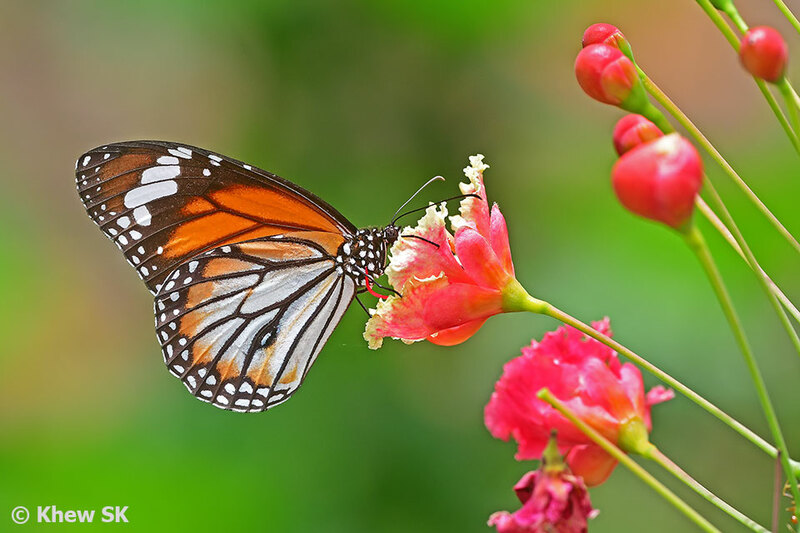 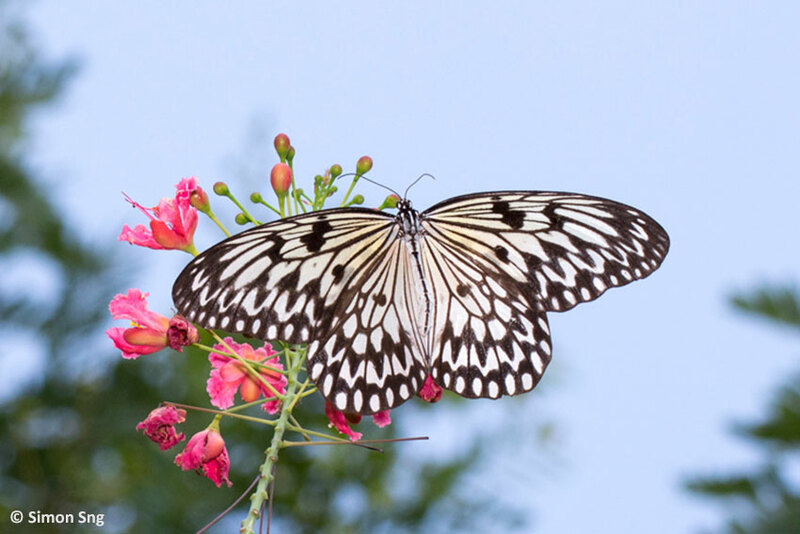 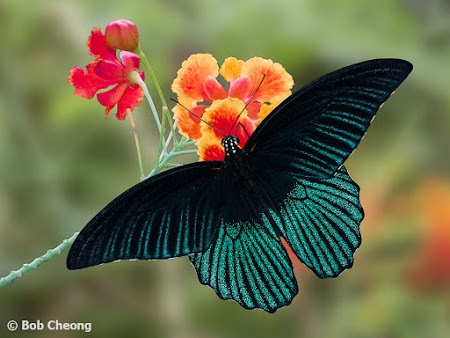 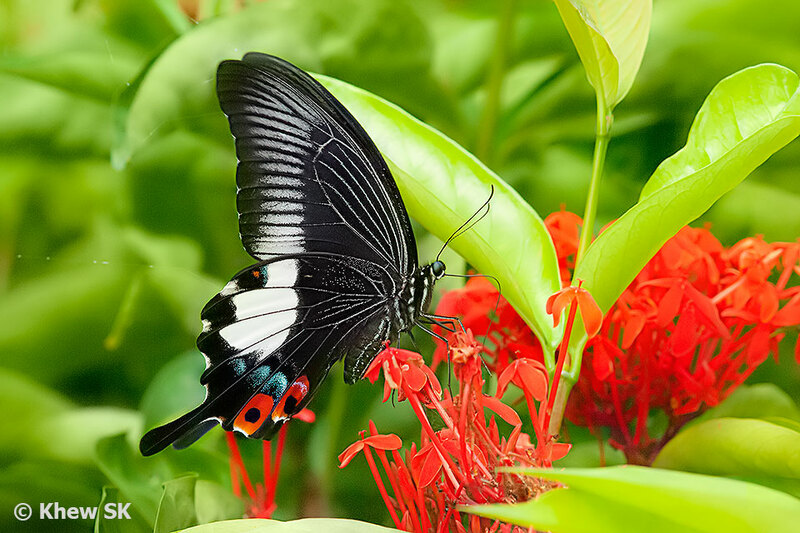 However, on certain days and in the morning hours of the day, the flowers appear more attractive to butterflies and they will feed greedily at the flowers. 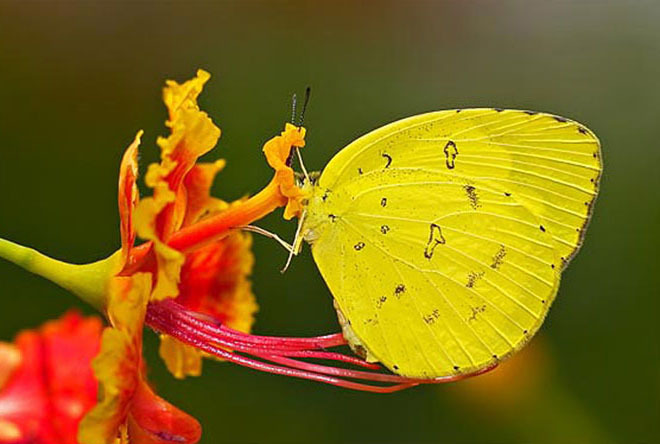 Perhaps this could be due to the quantity of nectar produced by the flowers at specific times of the day? 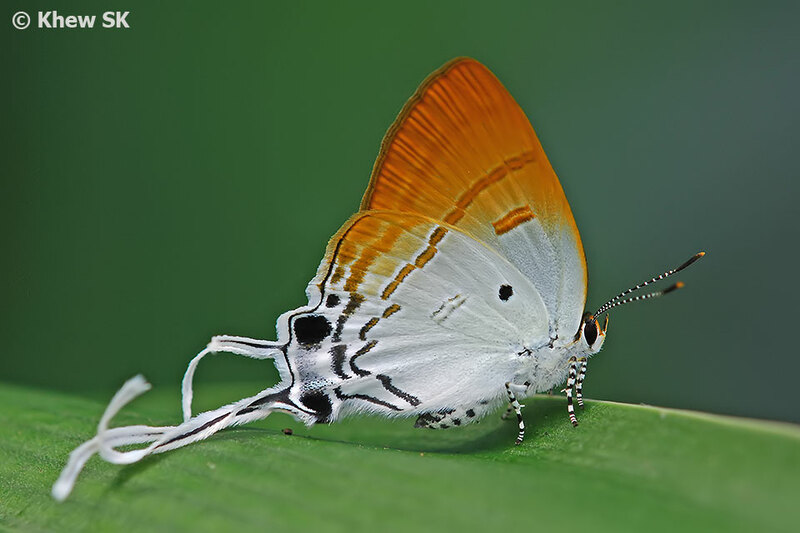 Or could there be some other explanation? Amongst the larger Papilionidae, the Common Birdwing, Great Mormon, Lime Butterfly, Common Mime and Common Mormon have been observed to feed on the flower of the Peacock Flower plant. 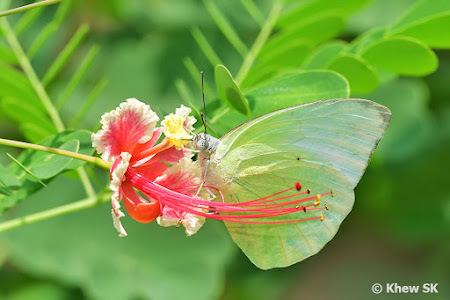 We have not observed other species of the Papilionidae feeding on this plant's flowers. 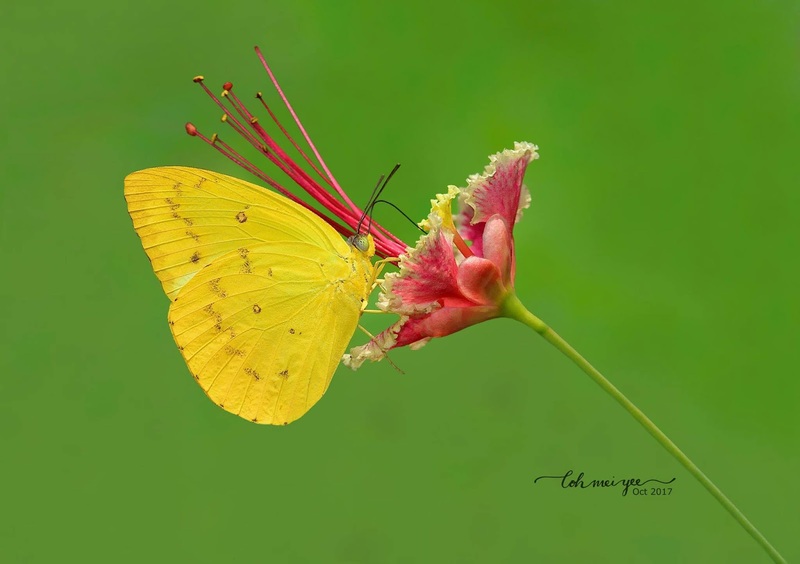 Various Danainae feeding on the Peacock Flower. 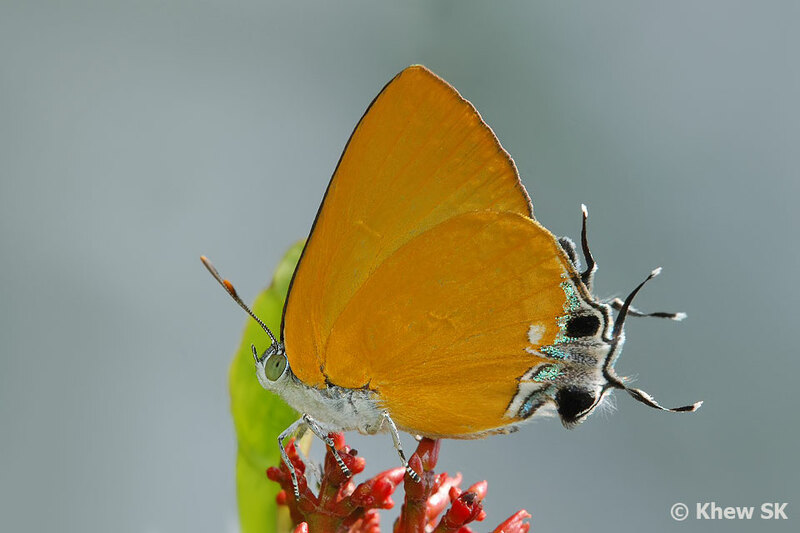 The Danainae are sometimes attracted to the flowers of the Peacock Flower plant. 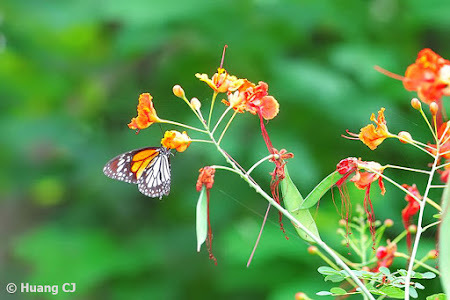 Amongst these are the Common Tiger, Plain Tiger and Black Veined Tiger. 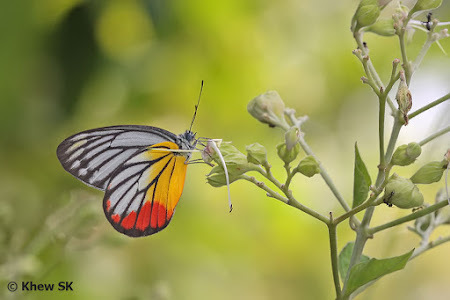 On a single rare occasion, the extremely rare Mangrove Tree Nymph (Idea leuconoe chersonesia) was photographed feeding on the flowers of this plant at high level at Pulau Ubin's Butterfly Hill. Amongst the Pieridae, we have seen the Lemon Emigrant, Orange Emigrant and Mottled Emigrant attracted to feed on the flowers of the Peacock Flower plant. The Grass Yellows (Eurema spp.) 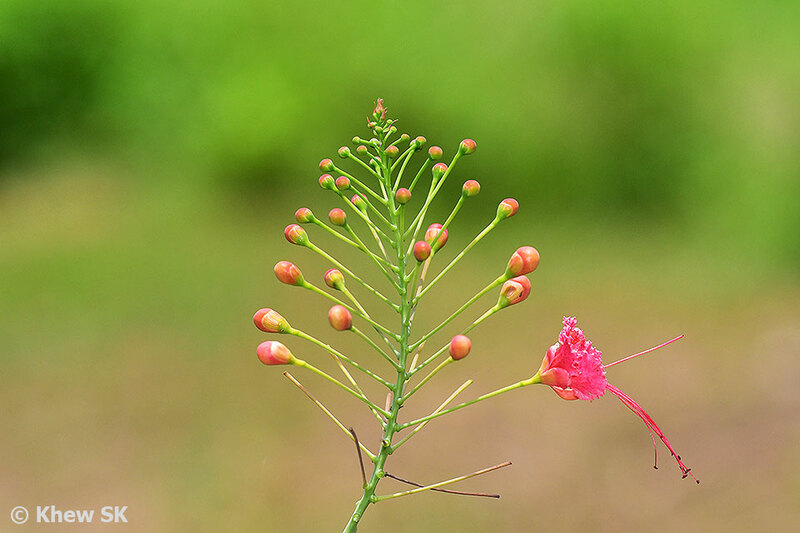 are usually active around this plant, but more likely because it is one of their caterpillar host plants, and not to feed on the nectar from the flowers. 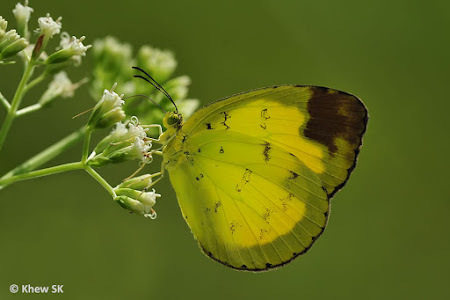 There was one occasion when a Common Grass Yellow was observed to feed on the flower of this plant. 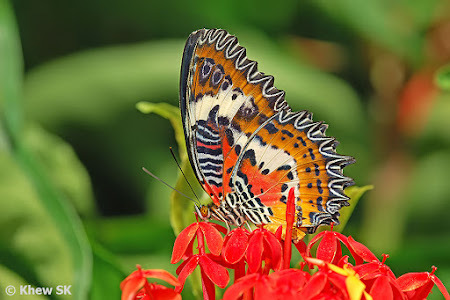 Thus far, there have been no observations of the other families of butterflies, particularly the smaller species, feeding on the flower of the Peacock Flower plant. 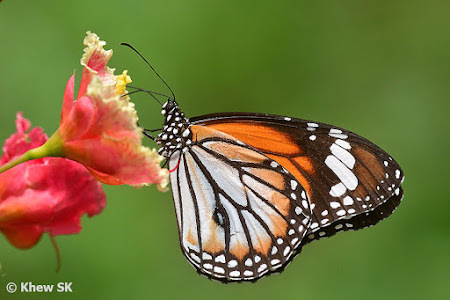 Despite its attractive bright colours, it is strange that the Peacock Flower is not more attractive to a wider range of butterflies. 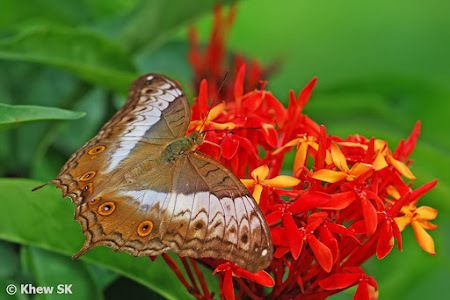 Even though there is enough evidence to show that the Peacock Flower is a butterfly-attracting plant, the range of species that feed on its flowers is unfortunately rather limited. In the selection of nectaring plants for a butterfly garden, it would be probably wise to combine several other more preferred nectaring plants with the Peacock Flower to offer a wider range of nectaring plants to attract more species of butterflies. Text by Khew SK : Photos by Bob Cheong, Huang CJ, Khew SK, Loh MY and Simon Sng. 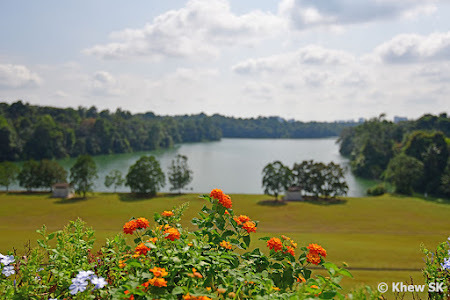 In our earlier article on butterfly photography at our local parks, we featured the Lower Peirce Reservoir Park. 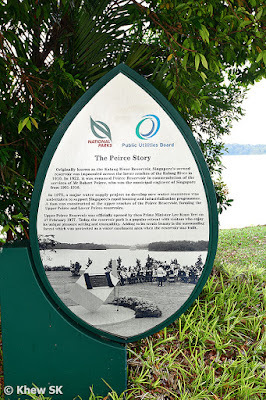 Originally known as the Kallang Reservoir, the it was formed by impounding across the lower reaches of the Kallang River in 1910. 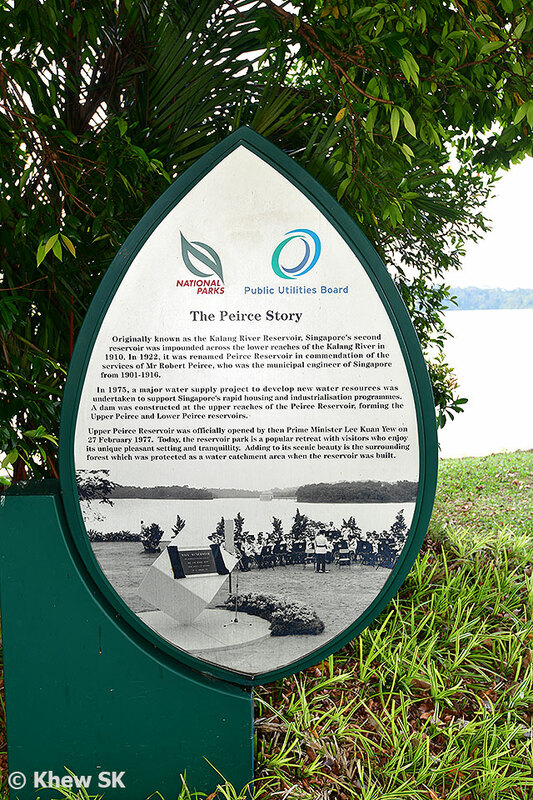 In 1922, it was renamed Peirce Reservoir in commendation of the services of Robert Peirce, who was a Singapore Public Works Department engineer from 1901 to 1916. 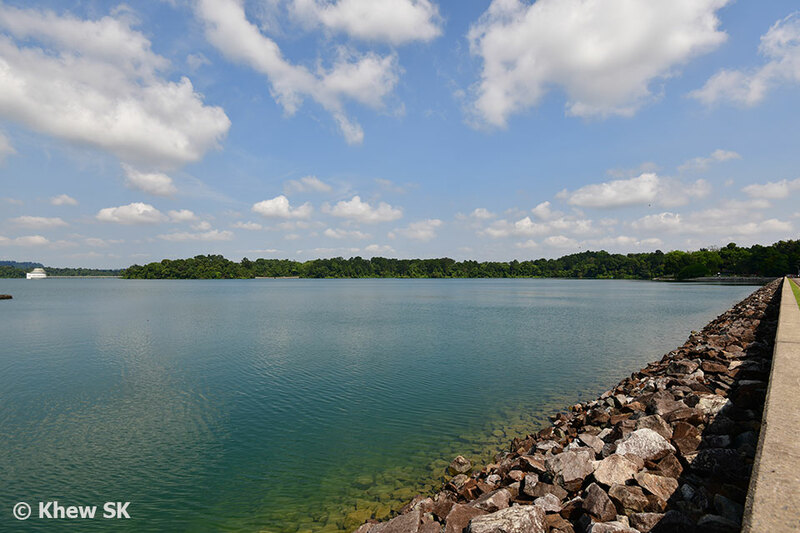 In 1975, a dam was built across the upper reaches of the Peirce Reservoir, splitting it into Upper and Lower Peirce Reservoirs thereafter. 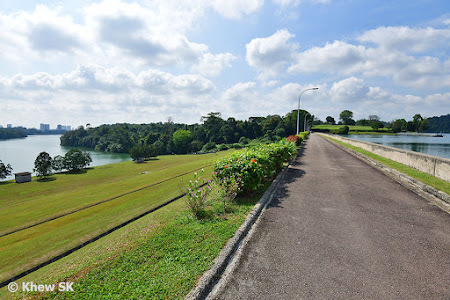 A view of the 350m dam separating the Upper Peirce Reservoir (on the right) and the Lower Peirce Reservoir (on the left). A 30m elevation separates the two reservoirs. In this weekend's blog article, we visit the Upper Peirce Reservoir Park. In 1970, the Public Utilities Board (PUB) conducted feasibility studies for the construction of a new reservoir in the vicinity of Peirce Reservoir. 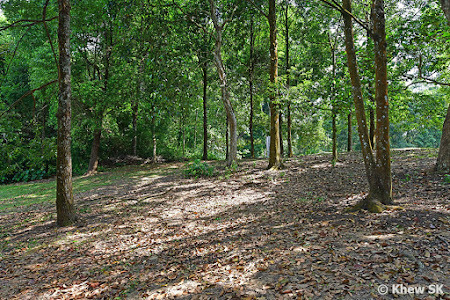 The site was found to be suitable and construction started in May 1972. 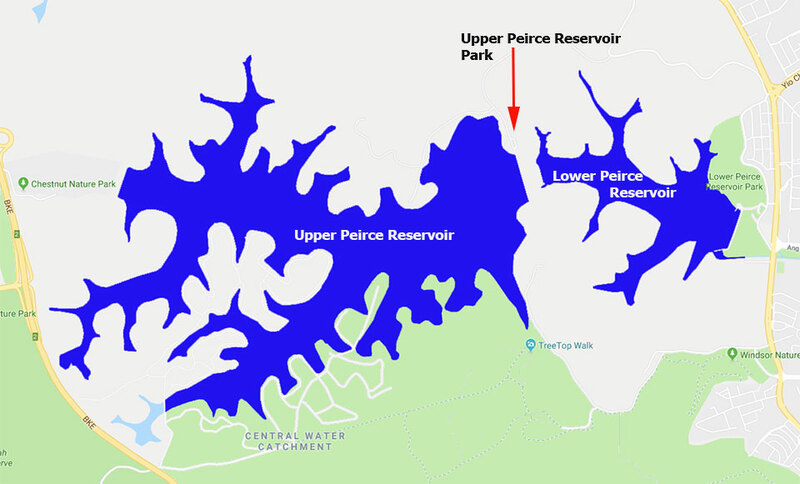 The works included the building of a 30-metre-high, 350-metre-long earth dam upstream of the existing dam, hence creating a new reservoir upstream of the existing one. 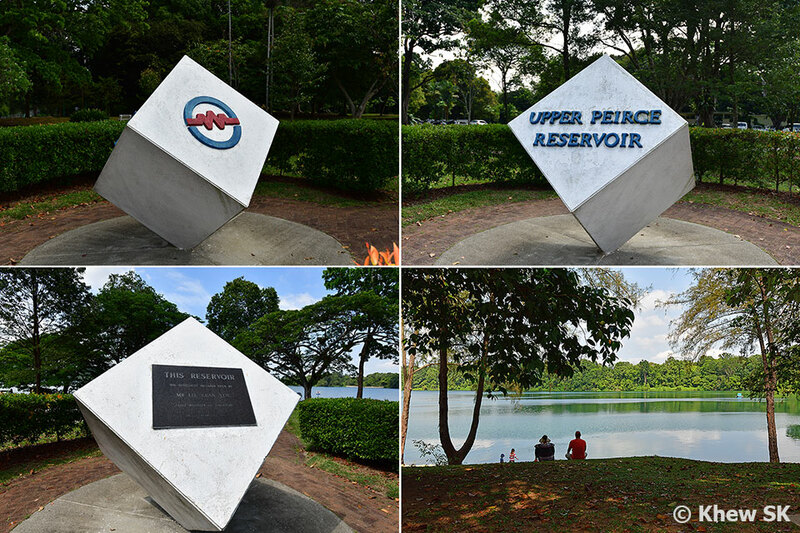 This new reservoir was named Upper Peirce Reservoir, while the older reservoir was accordingly renamed Lower Peirce Reservoir. 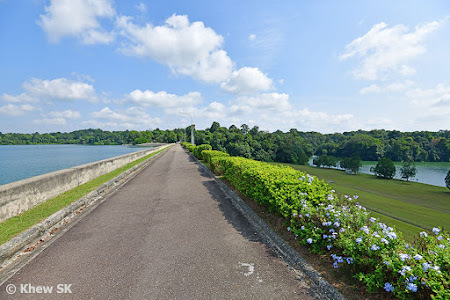 The Upper Peirce Reservoir was completed in 1975 and officially opened by then Prime Minister Mr Lee Kuan Yew on 27 February 1977. 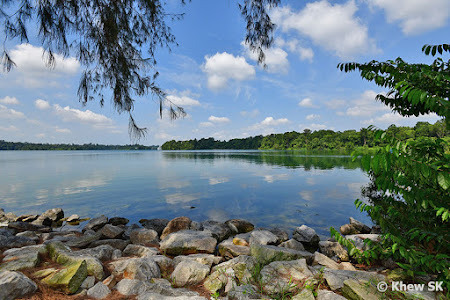 Today, Singapore has a total of 17 reservoirs spread across the island. The Upper Peirce Reservoir covers a surface area of 304 Ha and has a capacity of about 27.8 million cubic metres of water. 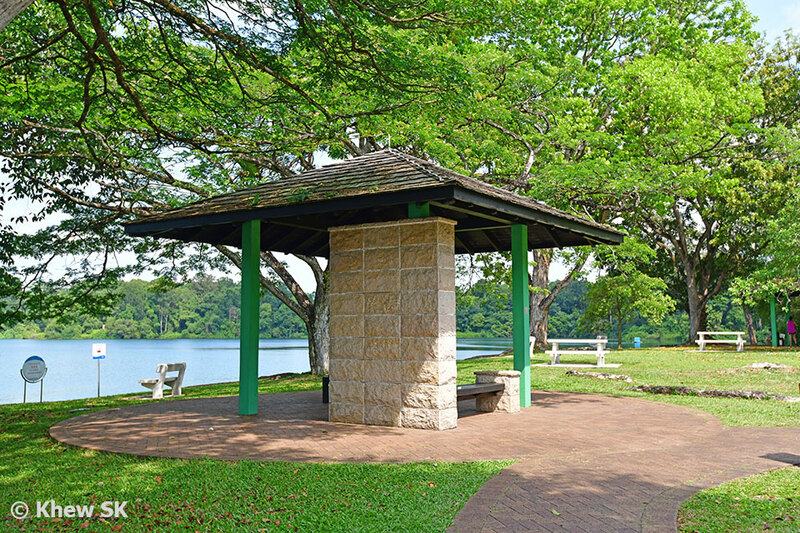 The Upper Peirce Reservoir Park is a serene and tranquil park located to the eastern banks of the Upper Peirce Reservoir (UPR). This reservoir, together with the MacRitchie Reservoir, the Lower Peirce Reservoir and the Upper Seletar Reservoir, bound the Central Catchment Nature Reserve (CCNR). 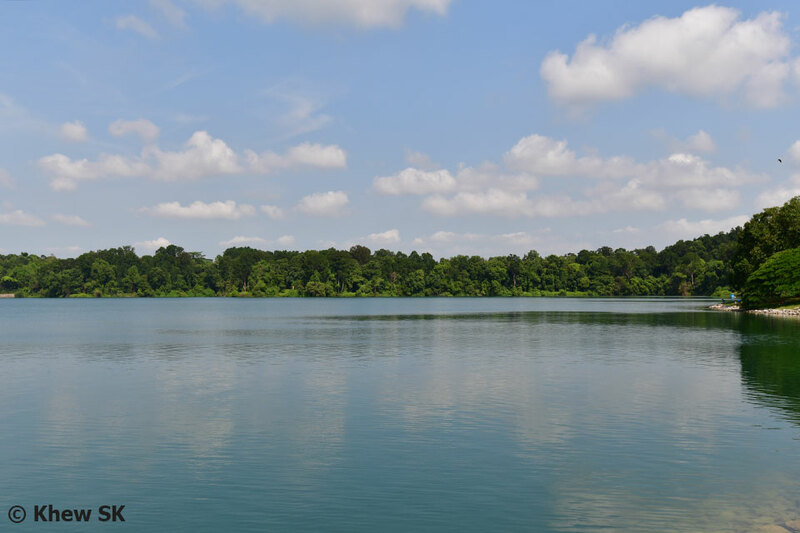 The nature reserve acts as a water catchment for the reservoirs in the area and is considered a protected catchment. 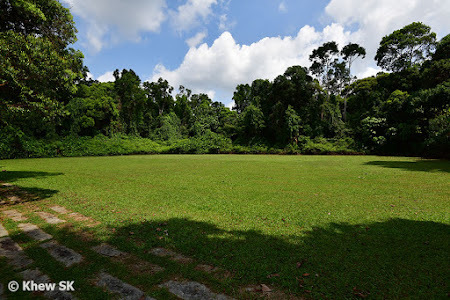 The Upper Peirce Reservoir Park covers an area of about 5 Ha. 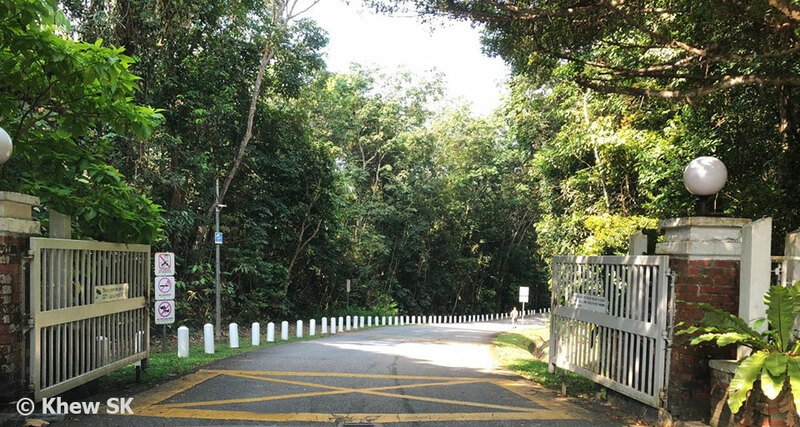 Access to UPR is via Old Upper Thomson Road, via a gated access. 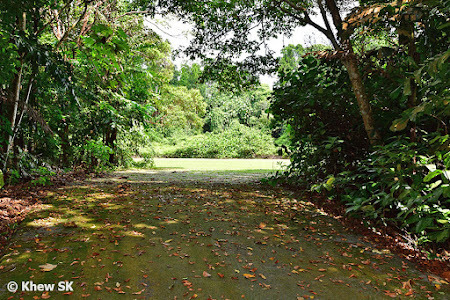 The gate is open from 6:00am to 7:30pm daily. 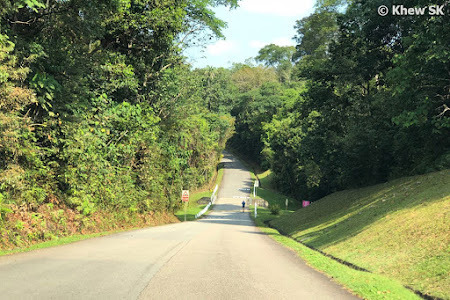 The scenic road is undulating (a challenge for cyclists and pedestrians, but excellent for an exercise workout) flanked on both sides by lush vegetation and tall trees. 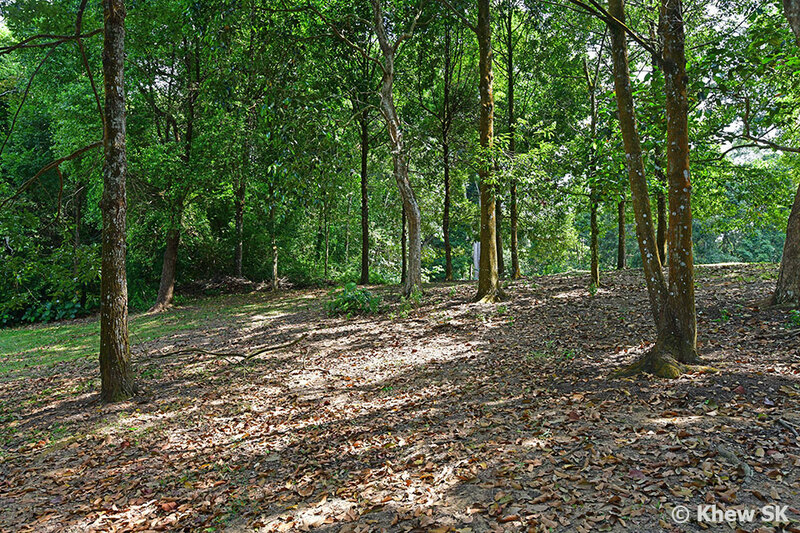 Do keep a lookout for various troops of the Long-Tailed Macaques who are used to visitors feeding them. 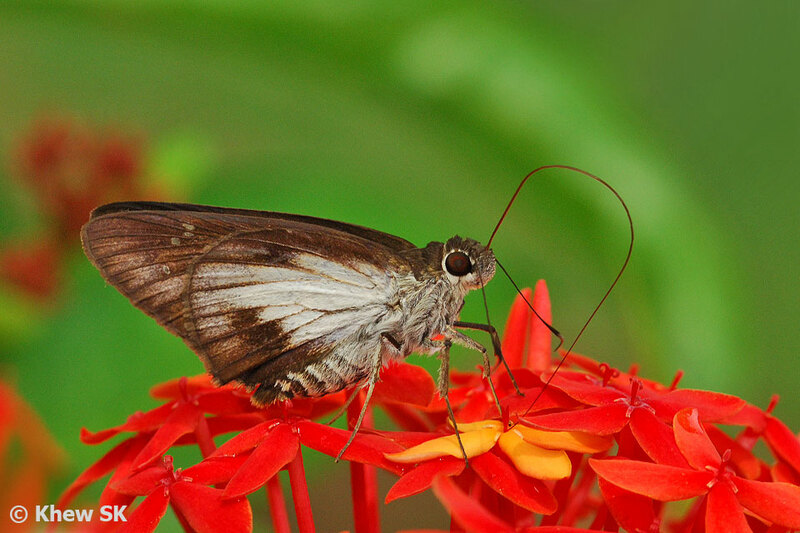 Some of them may be a bit more 'friendly' than preferred as they often associate humans with food. There is a carpark at the end of the road, with toilet and other basic park amenities like shelters, seats, rest areas and even water coolers. 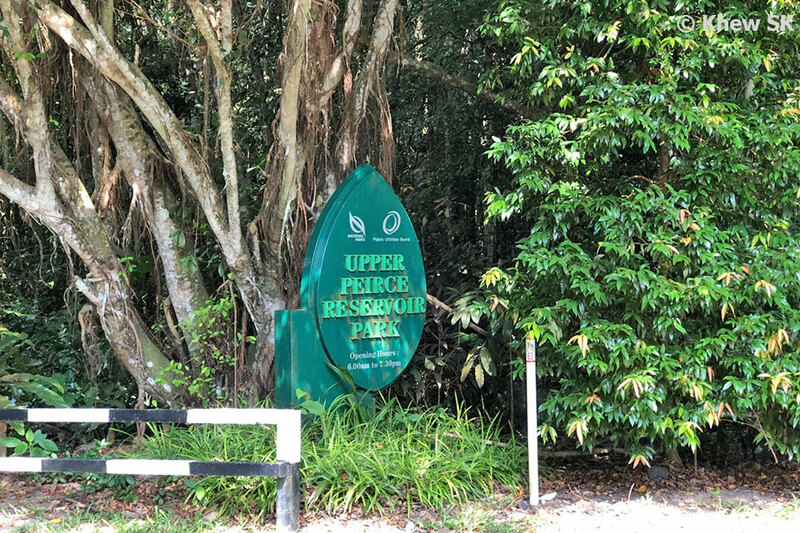 The 350m long earth dam ends in a golf course at the other side from UPR. The view of the serene waters of the Upper Peirce Reservoir (at the higher elevation) and the Lower Peirce Reservoir, some 30m below the earth dam is picturesque and beautiful. 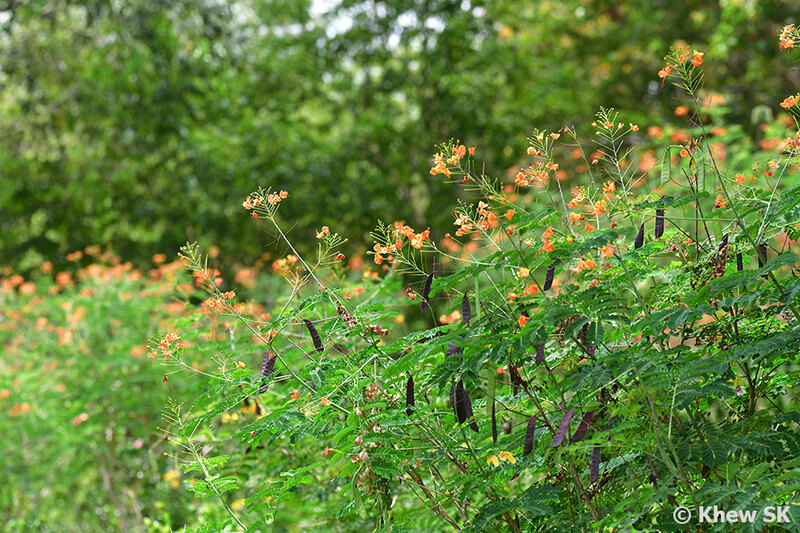 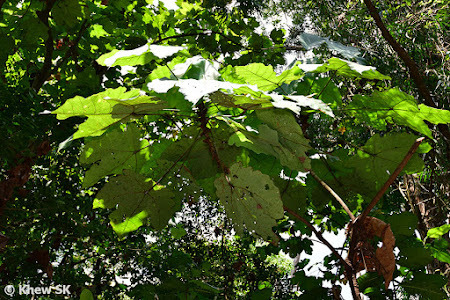 The vegetation at UPR is largely native plants that are typical of the flora of the Central Catchment Nature Reserves. 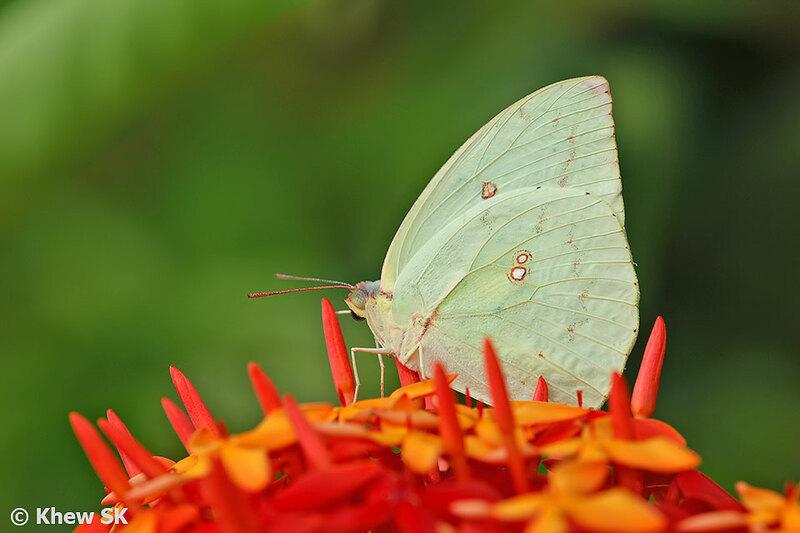 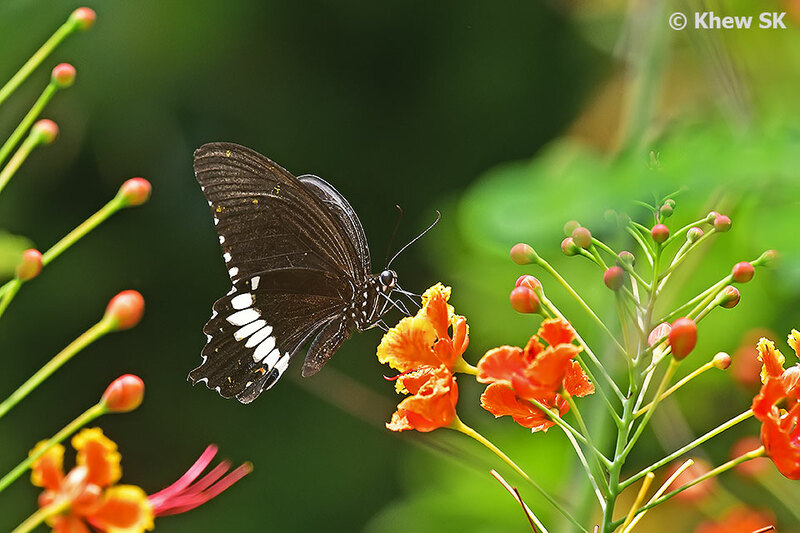 Some years ago, when the landscaping of the park for visitors was first started, the Javanese Ixora shrubs attracted a good variety of butterflies. However, these plants are now over their prime and what remains hardly attract any butterflies any more. 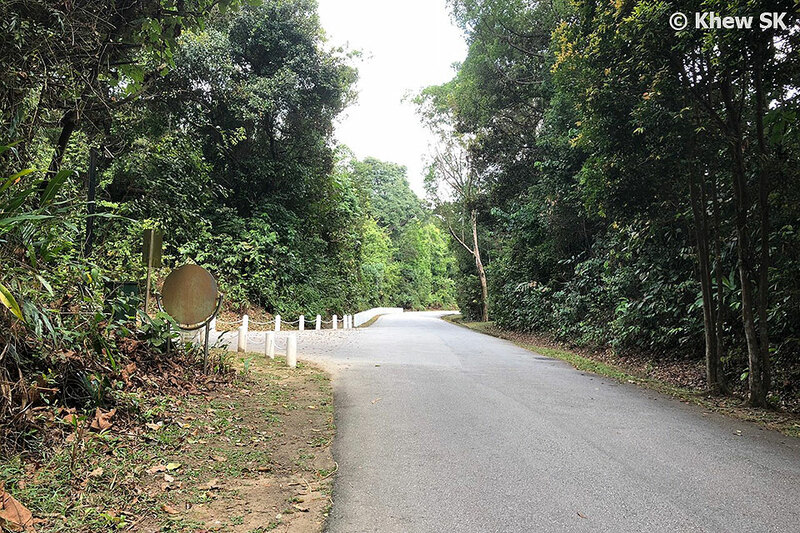 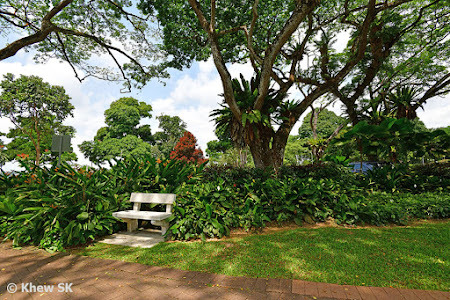 It is hoped that the NParks will continue to cultivate more butterfly-attracting plants in this area so that visitors can enjoy the diversity of species that are present in the CCNR. 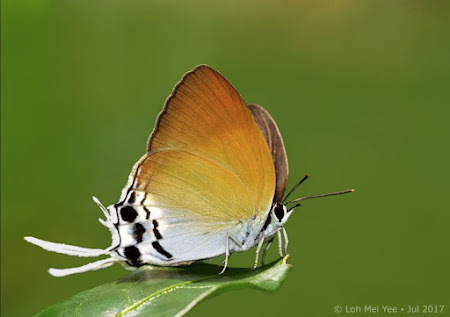 Walking around the open park areas, one can expect to see common butterfly species like the Chocolate Pansy, Common Mormon, Common Four Ring and several species of the Grass Yellows. Occasionally, a few Cruisers, Barons and various Hesperiidae can be seen on hot sunny days. Exploring along the side road leading to the service reservoir and treatment plant where water from UPR is treated and stored, a visitor may be treated to some rarer species that live in the forests of CCNR. 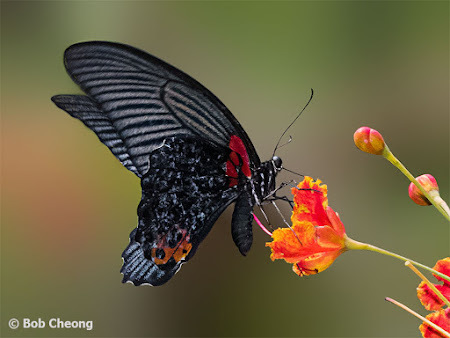 As there are not many flowering plants in the area, it is usually more challenging to photograph butterflies, but keep a sharp eye out for those that visit the flowers of the Bandicoot Berry flowers and other native flowering shrubs in the area. 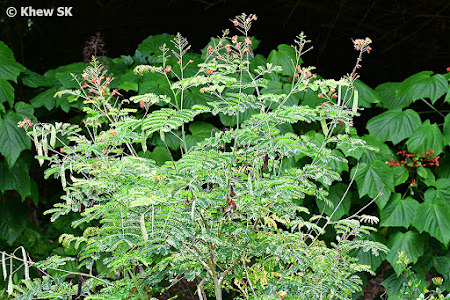 There is an open area along this service road that has flowering shrubs like the Mile-A-Minute weed that may sometimes attract various species of butterflies in the early morning hours. 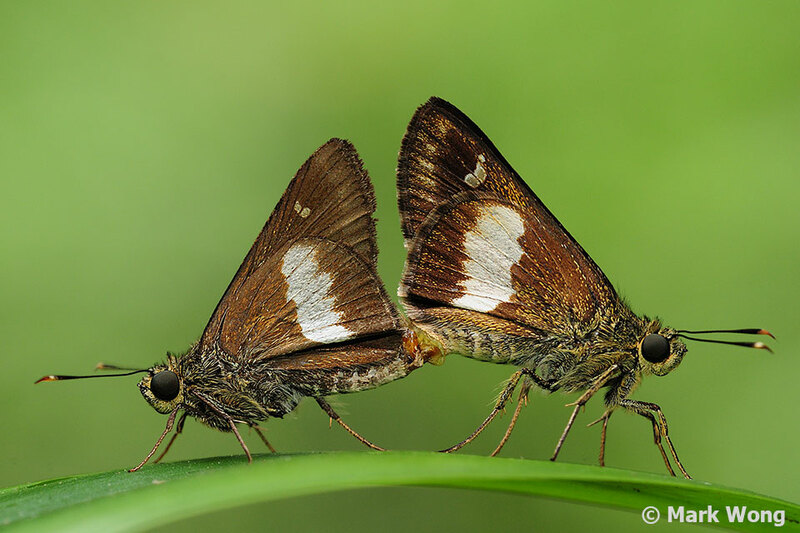 Keep an eye out for ovipositing Malay Viscounts, Malay Barons and the odd OakBlue (Arhopala spp). 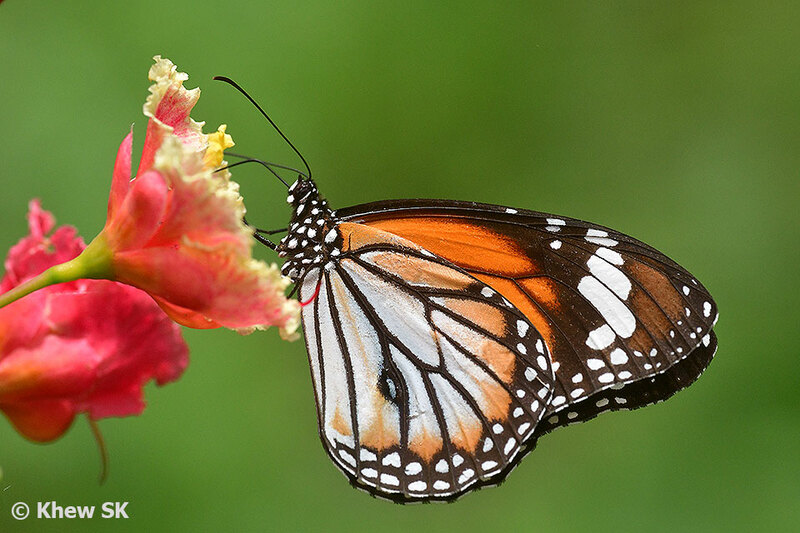 that visit their caterpillar host plants in the area. Walking further in towards the fenced Service Reservoir, one can sometimes encounter species like the Common Bluebottle, Lesser Jay and Five Bar Swordtail puddling in the damp areas in the drains. The proximity of the CCNR may turn out surprises once in a while and over the years of surveys and outings in UPR, there have been encounters with very rare species before. 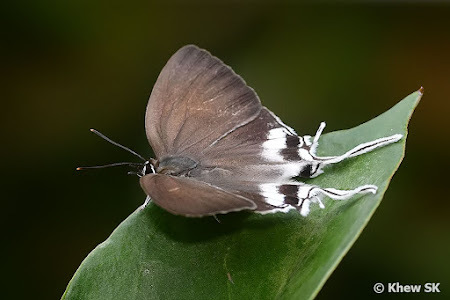 Some examples of the rarities spotted at UPR include the Black and White Flat (Gerosis limax dirae), the Spotted Silverstreak (Iraota distanti distanti), the Golden Royal (Pseudotajuria donatana donatana), the Hoary Palmer (Unkana ambasa batara), Dark Banded Ace (Halpe ormenes vilasina), Green Imperial (Manto hypoleuca terana), the Great Imperial (Jacoona anasuja anasuja), The Grand Imperial (Neocheritra amrita amrita) and Banded Royal (Rachana jalindra burbona). So keep your eyes peeled and hope that you get lucky! Upper Peirce Reservoir Park cannot be described as a 'butterfly haven', but its adjacency to the Central Catchment Nature Reserves may sometimes turn up something surprising and rare. A typical walk on an ordinary day may not yield anything more than some common species, so if that happens, just enjoy being out there in nature and the splendid views of the reservoirs and the lush greenery that surrounds you! 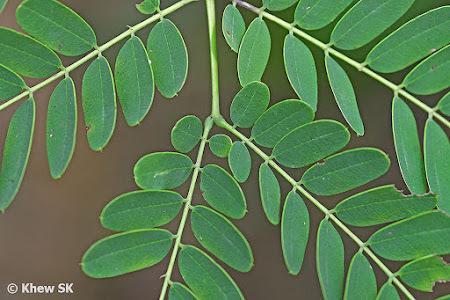 Bus nos. 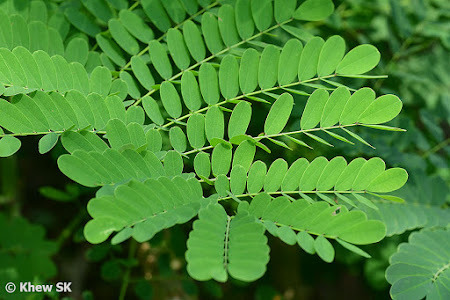 163, 167, 169, 855, 980. Alight at the bus stop nearest to the Casuarina Curry Prata shop and walk along Old Upper Thomson Road towards Upper Peirce Reservoir Park. Be prepared for a long walk in and out! Estimated walk in one direction is about 30-45 mins. 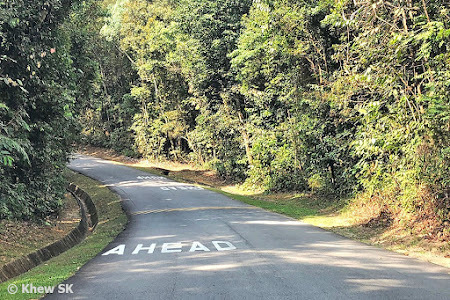 By Car : Follow the direction of Upper Thomson Road. 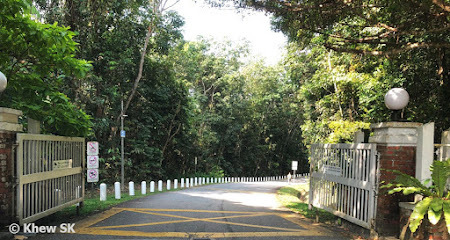 Turn left before the traffic lights at the junction of Ang Mo Kio Avenue 1 into Old Upper Thomson Road. Follow the road until you see the entrance of Upper Peirce Reservoir Park. 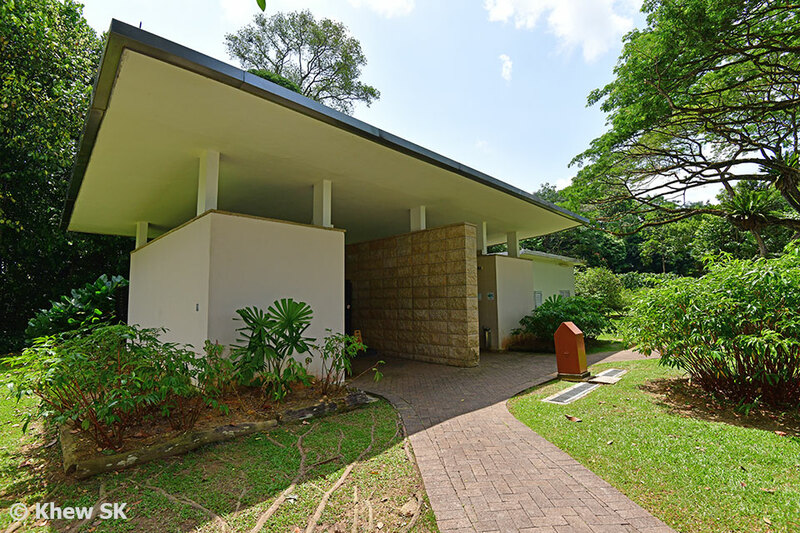 Parking facilities are available at the end of road near the toilet (Free parking).